We are a cultural consultancy, for communication and innovation, created in 2009, located in Vitoria-Gasteiz and led by Roberto Gómez de la Iglesia. We mainly carry out hybridisation projects aimed at companies and organisations of all types. In addition, our processes seek to overcome traditional methods, carrying out a consultancy more aimed at the centre of the problem and at its solutions; with less paperwork and with the collaboration, as far as possible, of the members of the organisation. At c2+1 we have developed Conexiones improbables (improbable connections), N.I.C.E. Award. 2014. 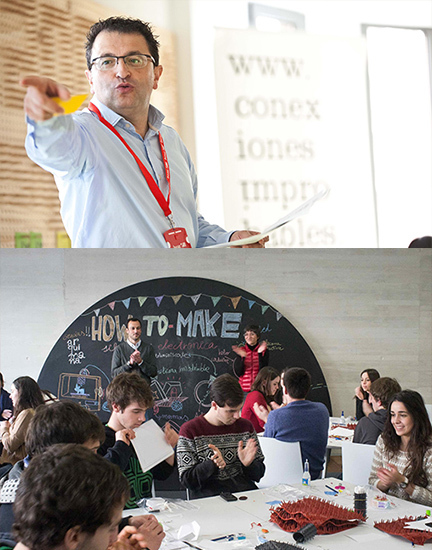 Conexiones improbables is an open and collaborative innovation methodology with an artistic and cultural foundation; a platform for hybridisation and transdisciplinarity for change; a community of people and organisations with a passion for disruptive innovation. Since 2010 the platform has carried out more than 100 projects.